Getting yourself a garment rack is the easiest way to organize your home. One of the biggest causes of clutter at home is clothes lying around the house. Garment rack makes an excellent storage for your "extra" things without overcrowding your main closet. It's portable, cheaper than a standard wooden closet, and can be easily stored away when not in use. You can assemble it and place it anywhere. Plus, they don't take up too much space in your home. I personally use a canvas garment rack for my clothes. We have very limited space at home and we don't have closets pre-installed in our apartment. We won't be living here forever, so we didn't bother to install one. To make things simpler, we bought a canvas garment rack and placed it in a small space at the corner of the bedroom. Honestly, I prefer a wooden closet. Aside from its being sturdier, it looks much nicer than a portable garment rack. Wooden closet makes a home look cozy. That said, garment rack makes a practical and instant solution to your lack of storage problem. The one I had when I was a kid was very sturdy. If I were not mistaken, it was made in Taiwan (most canvas garment racks were made there). The canvas was thick and had withstood years of zipping and unzipping before a hole finally formed. My old rack had even survived the 1991 earthquake when Mt. Pinatubo erupted (it's the second largest volcanic eruption of the 20th century). Taiwan used to produce these durable canvas closets. Sadly, these Taiwanese closet manufacturers had either stopped producing them or had already closed down. China is now the leading manufacturer of these garment racks. It's tough to find a durable one among these Chinese-made brands which honestly, aren't as sturdy as the Taiwanese brands. With years of using (and buying) portable garment racks, I know what features to search for when shopping for one. I have searched on Amazon and has come up with the best ones in my opinion. Of course, I have also studied the reviews of the customers and will include some key points about the products. When buying a garment rack, make sure that it's sturdy and is made of good quality materials. I have been a cheapskate and bought a flimsy one just because it's cheap. Needless to say, it had cost me more money for having to replace it so soon. I learned that if I want to be frugal, I have to opt for quality and pay a bit more. There are some good racks with thin and flimsy cover. I think you can buy them if you can deal with broken zippers (or if you don't mind fixing it yourself). This is said to be very sturdy. You can fill it with clothes and still has it standing tall. The wheels add mobility to this closet. You can assemble it and put in all your clothes before deciding where to place it in your room. Another thing that I love about this garment rack is the position of the zipper which is at the center of the closet. This gives you easy access even to the innermost part of the closet. Most covered garment racks I see in the local malls have their zippers on the side which makes it difficult to retrieve things from the opposite side. This heavy-duty garment rack is exactly what I'm looking for. It is very sturdy and you can keep on adding stuff to it and it's still intact. I used to have one with an unstable metal frame. The hanging rod was sturdy, but every time I hung more garments, the rod would somehow fall out of place. 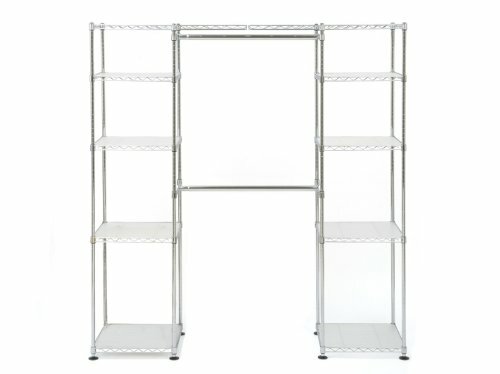 This Alexa garment rack has durable shelves. The top shelf gives you plenty of space to pile up your boxes. With this Alexa rack, you can put away your clutter without worrying about your rack's falling apart. Plus, it's very easy to assemble (even for ladies)! This Whitmor garment rack is sturdy and roomy. You can store lots of things including your bulky winter clothes. The clear view window will give you a quick view on what's inside. Like the Organize It All closet, the zipper opening is at the center, allowing you easy access to everything inside. However, the downside of this product is the covering which is thin and fragile. That said, it's very affordable and worth your money. I like the idea of having two hanging rods in my garment rack. This dual closet rod is ideal for storing your tops. You can also remove the lower rod if you choose to hang longer garments. The shelves on the side are very roomy. You can store your bulky things such as bags, towels, blankets on the shelves. The top shelf allows you to stack your other less used items such as seasonal clothes, pictures, and whatnots. This product is said to be very sturdy but surprisingly lightweight. 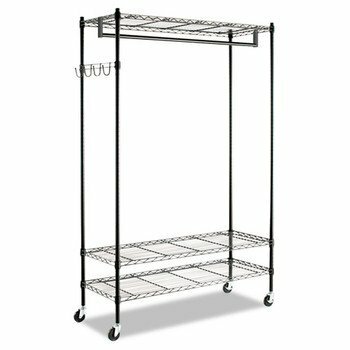 This high-quality garment rack is my favorite among the racks listed here. Aside from having two hanging rods, this one is expandable! The shelves on both sides give you additional storage. This rack doesn't only reduce your clutter, it also looks amazing in your room. The shelf liners are excellent for keeping small objects from falling. You can also buy nice looking boxes or baskets and place them on the shelves.